inscription: "10/04 WEL219" printed vertically in white up the bottom right edge. Poster has a pink background with white text. Blurred "fetch" at the top followed by "a dog from a shelter, not from a pet store". The text continues at the left center with "this puppy will pay with her life if you buy from a pet store. 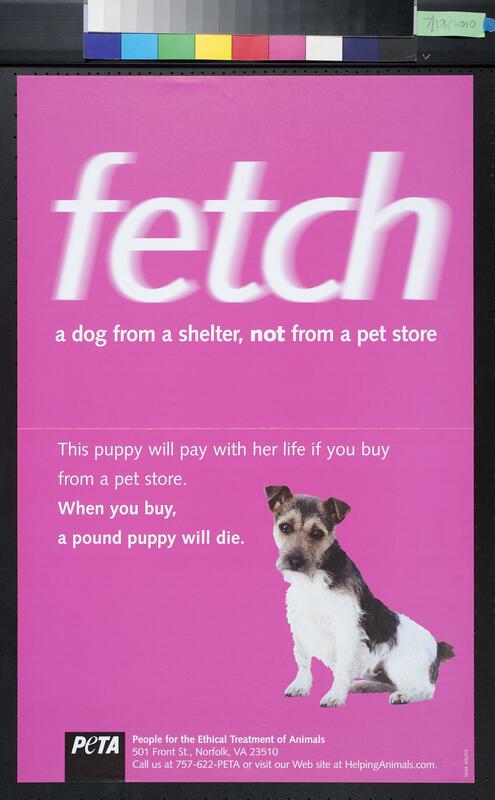 When you buy, a pound puppy will die". At the bottom right is a photo of a brown and white puppy sitting with her head cocked slightly to the right. At the bottom of the poster is the PETA logo, address and website.